It has been a little while since I posted a review. I was busy playing with my new acquisitions (several of them). I received my Hatsan AT-P1 on Friday the 13th. I didn’t want to be supertitious but it really started badly. The pistol was shipped with an empty reservoir and it was impossible to build up the pressure with the pump. The air was leaking out as fast as it was going in. I tried my paintball tank with the same result. What a drag!!! Luckily I got some hints from the forum people and finally unstuck the valve. At least I was able to fill it and shoot several mags. If you have the same problem, unscrew the tube and look at the end, the valve stem should be sticking and not flush as mine was when I received it. On the Saturday, I filled it and emptied it several time and shot a lot of pellets. Over this test, I experienced a few unhappy things. When I received my AT-44 rifle, it was perfect out of the box. I liked the trigger and it was shooting very well. Also I am still always surprised how many shots I can get from a fill, it seems to last forever. With the AT-P1, I was not so happy with the trigger. Normally I prefer not to change the factory settings but in this case I wanted to reduce the pull travel. After a few adjustments of screw #2, I found a spot where the travel was OK but sometime for no appearent reason it was a lot shorter and the pistol was shooting unexpectedly. After a while I discovered that it was happening the few times I was forgetting to remove the safety before taking my shot. A pistol shooting when it is on safe was really not a good idea. I re-increased the travel to have something acceptable and at the same time keep a working safety. I also had several misfeeds, a pellet jam that caused me some headache to unjam and a few unvoluntary firings because it seems the sear was not engaging properly when I pull the indexing lever for cocking it. Luckily I didn’t cause any damage except for a pellet lodged in the fiber of the basement carpet and I was able to extract it. On Sunday, I had two sessions with it. In the morning it happened again that the gun shot when I was cocking it. In the afternoon, everything ran smoother than the morning without any trouble. Hopefully, the break-in will solve those small glitches. If some other people experienced the same problems with their pistol, it would be interesting to hear it. Because this pistol is set to be shot right-handed only and I prefer to shoot mine from both sides, I decided to make a pair of wood grips for it. It was a fairly quick project for once. Normally I always get in trouble with the position of the screws holes in relation to the contour but this time it didn’t happen. Saturday, I started just before 16:00 and by 20:00, I had an ambidextrious set of grips installed on the gun. I was not sure about the contrast of natural against synthetic but finally I am fairly pleased. They are also very comfortable for shooting right-handed and left-handed. I can get five mags from one fill or 50 shots. During the last mag, the point of aim was slightly rectified to shoot higher on the target but for the last 2 shots the correction was a bit more noticeable. The reading on the gauge was about 50 bars. This means a comfortable 45 shots can be achieved with a starting fill of 190 bars. 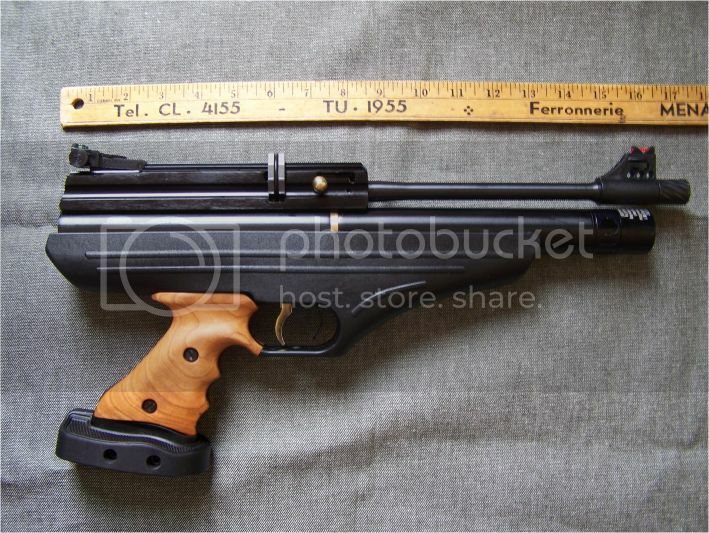 This is a big pistol (16 ½ inches long by 8 high). It can be comfortably shot with both hands but for single handed shooting its weight can be felt. Having arms the size of Arnold’s would be a distinctive advantage. I shot a few more mags and I still have a problem with the indexing of shots. I didn't experienced any more impromptu firing so that is one good thing but still the sporadic indexing is annoying. Any other Hatsan AT-P1 owners having experienced the same thing? If I compare with the AT-44, sometime the first pellet is difficult to align and to insert but once the mag is in, all the shots are smoothly fed. 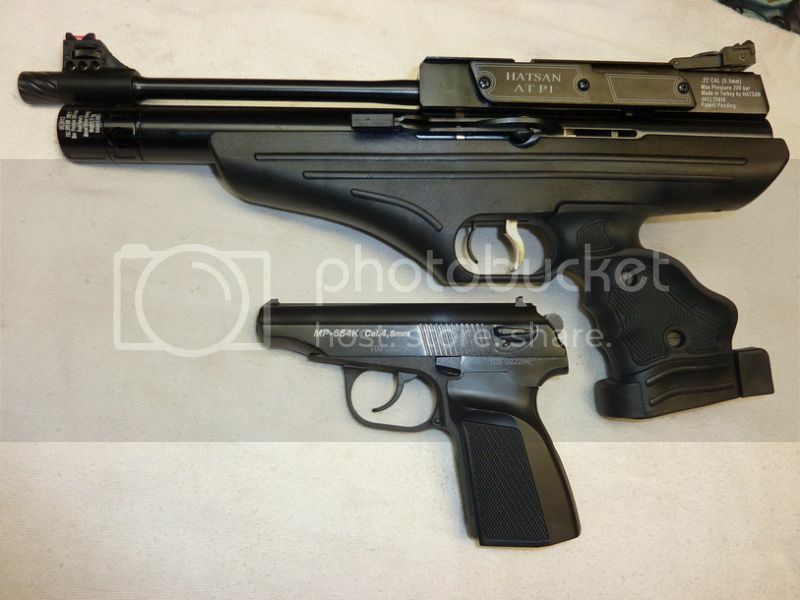 Dukemeister mentioned the same thing concerning the first pellet with his AT-44. Wow beautiful pistol. Purchased from Dan??? Excellent work with those Grips. Very very nice looking. Think the colours goes very well together. Wanna sell me a set? My first thoughts when I opened the case was "What a HAWG!!" Mine, .22 cal, arrived with a 150 Bar fill. Wanted to get at that stem, so I shot her down using Cr. competition wadcutters. went through 3+ full mags and had no jambs. Little catchy maybe cycling the first few shots but seemed to smooth right out. Safety was hard to disengage after loading each new mag. But just for the first shot. Can be shot accurately with one hand, but like you said gets tiring very quickly. She's a two hander allrighty. Sights were pretty much on the money right out of the box. Had no miss fires yet or indexing problems. But I only have 3 mags through her. Will have to see how she does in the long term. So so far so good and I am quite happy with her. Took a pic with one of my smaller pistols in order to try and show a size comparison. You are right. Sniper sells them. Thanks for the info, at least it gives me a point for comparison. As for the grips, sorry, I don't make any for selling. I have a whole lot of airguns and I have barely the time to make a few grips if I want to be able to shoot them too. Also I am not very patient with the finish sanding. They look good, they feel comfortable but they are probably not at the level to be sold. The one for the AT-P1 has been the easiest to make even if they are very contoured. You could try it. You just need a scrap of hardwood flooring, a scroll saw and a Dremel tool (and some time). I will update this post once I have more tests but you were right, the sights were on the spot straight out of the box. Anyway have a nice day both of you. Had sometime to check mine out. Out of the box mine chronyed 440's with JSB 14.3 gr. lead. My airtube came apart just like the BT 65 air tube but looks exactly like the AT 44 tube inside. Removed .010 from the stem and plugged 5 holes with 6x40 set screws. Gets 20 hard shots from 200 barr down to 115 barr. Don't know about the sights but will use a red dot anyway. Of the shots 18 were within 27 fps of each other from highest to lowest and the last 2 were still very acceptable. I screwed a AT 44 long airtube to the pistol for fun just to try it out and got close to 50 good hard shots but not very practical as the P1 is a pistol. It can be a decent hunting pistol up to 25 yds. The only drawback is the puny 50 cc airtube but that can be remedied if you carry a couple spare tanks. It is a man sized pistol for sure. Thanks for the info. So it seems that you didn't have any problems with the feeding mechanism? I shot another 40 pellets tonight and the pistol seems to break in. All of the shots but one indexed properly. It seems to be on the right track. Yesterday I had another 40 shots through it and again I had 1 skip but what was worse was that also got 1 unwanted shot (pistol shooting by itself) similar to what I had experienced several days ago. Furthermore, I had filled the pistol to 190 bars before storage the day before and the pressure was 150 bars when I got it out for my shooting session yesterday. It means that there is a slow leak. Again I stored it at 190 bars and I will see if it will hold pressure today. Magnumair mentioned in a PM to me that he experienced leakage with his reservoir and even with the replacement he had other issue with the probe. Any other AT-P1 owners who can contribute information are welcome. It would be interesting to know if some of them work flawlessly directly from the box or if they all have glitches. Dan replaced the faulty air tube and I machined the probe and now the pistol operates very well. Put a mild tune on it and get 2 mags of JSB 18.1 gr. or 20 decent shots. Mine is more efficient with the 18 gr than the 14 gr. Will try 21.1 gr next time. 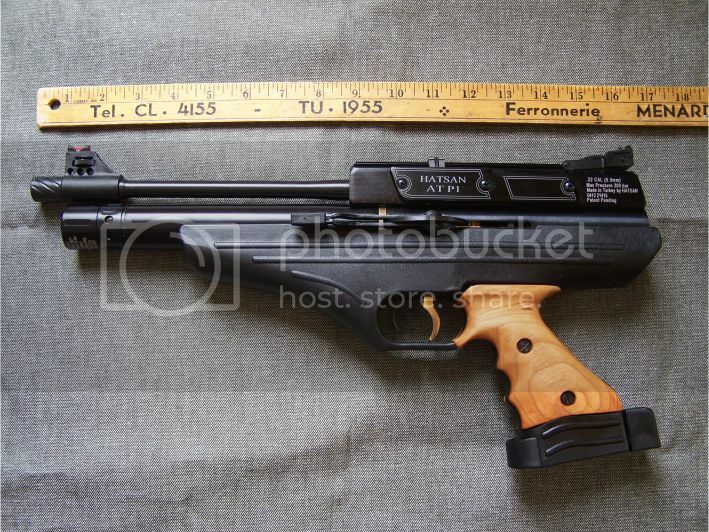 This pistol never had any indexing issues only airtub and probe problems. Overall I like it, reminds me of my AT 44'S in a smaller package. Overall I like it, reminds me of my AT 44'S in a smaller package. Mine has been great, right out of the box. Much the same as both my 44's were. No real issues with the exception of a stiff safety at times, initially. I checked again yesterday and the pressure was down a bit. It seems to be a slow leak as it lost about 30-35 bars in 24 hours. This is probably the reason my pistol was completely empty when I received it. The break-in seems to make a difference as the indexing is becoming more consistent. I had 30 shots with pellets and just for the sake of working the mechanism and maybe expelling the dirt in the valve (if there was any), I refilled it and shot 40 times without pellets. I refilled it to 190 bars and store it for the night. It lost some pressure overnight. I was wondering if anybody knows the difficulty level of resealing the reservoir because that would be the next thing I have in mind (or maybe ordering an extra tube if they are available and not too expensive). OK I should stop complaining and post some more fun results. I had 50 shots this afternoon and it was working fairly well. I can tell that in my garage, offhand at 25 feet, it is a beer bottle caps mangler. After 1 mag each cap was utterly destroyed, I averaged 8-9 hits on 10 (and the misses were really close to the target). With my grips I was able to shoot left handed too. The first 10 shots are really more powerful than the others. The first cap was pierced each time so there was not much left at the end. The second had a couple of holes but the others were only badly crumpled. Anyway I am happy with the result. Pete a new airtube cost $100.00 + shipping. The slow leak you have is most likely coming from the valve stem seal. I had 6 airtubes and never had them leak from the guage end or the big o ring on the other end. Always been valve stem leaks. you check the little bottle that came with the gun you will see a little white button with a tiny o ring around it, this is your valve stem seal. If you want to know how to change it pm me your phone # and I will call you and tell you. Keyboard take me to long. I will probably order a new cylinder and a spare O-ring. I will contact you sometime next week when it is in. You will not get a spare o ring you already have a spare valve stem seal. That is what you must change. I'm done.